When gout hits you want ALL the help you can get. You can do more than just take pills. You simply need the right treatment for you. Different people respond differently to treatments. What works well for one person might not work for another. Ibuprofen helps most people, but it surely doesn't help completely. It takes more than Ibuprofen to deal with pain and swelling. Compression definitely helps with swelling. For some people heat helps, for others cold works better, some people use both. You won't know until you try, but do try because when you find which one works the relief can be amazing. Ibuprofen helps with the pain but it does nothing to alter the cause of the Gout attack. Ibuprofen does not help your body heal. The attack only ends when your body reabsorbs the crystals that have formed in your joints. Stimulating blood flow in the affected area can help the reabsorption process. You want to relieve the immediate pain. You want to promote blood flow to help your body heal quickly. You want to rest the joint because motion aggravates the symptoms. Rest. Treat the pain using a ColdCure® wrap. Treat the condition with BFST® to promote the absorption process. Treat yourself with BFST® first thing every morning. Treat yourself with BFST® 2 or 3 more times throughout the day. This is to help the attack end quickly. Wear a ColdCure® wrap as much as possible. This will reduce the swelling and protect your foot from further damage while you heal. Whenever you need additional pain relief, swap out the RigiGel® with one from the fridge or freezer. Rest the area as much as possible. Giving your joint a rest is hard, but it is very important to not aggravate the area. This minimizes the pain and swelling. Do more than just take pills - Help your body. Treat the underlying problem..
You don't have to wait it out. You can try to speed your recovery with the right treatment. King Brand Healthcare Products® are the innovators of Blood Flow Stimulation Therapy (BFST®). For recovering from a Gout attack, blood flow is critical to monosodium urate reabsorption. Blood flow brings oxygen and nutrient-rich blood to the synovium. And the synovium is the key to healthy joints. Ample blood flow to the synovium is a requirement for the body to heal itself. Unfortunately, an injured joint at rest often has restricted blood flow, which in turn limits the body's ability to heal. Physical activity will promote blood flow but, in the case of Gout, activity makes the symptoms worse. 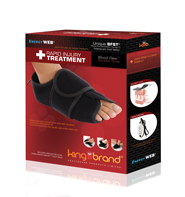 With a King Brand® BFST® therapy device blood flow can be stimulated in the injured area while the patient is at rest. With improved blood flow and without physical activity patients can promote the processes that end the gout and not just treat the symptoms. When pain killers mask the pain and cause you to be more active than your joint is ready for, you can prolong the symptoms. This only makes things worse. It is understandable that people need relief from pain, so if you have to take pain killers try to restrict them to managing pain and to helping you sleep. If you are using them to 'drive through' your attack and keep active, you are going to aggravate your condition. Pain killers, like Ibuprofen, thin your blood and can be hard on your stomach too. Pain killers can harm your body, especially when you take them for a long time. Don't suffer with pain needlessly. Pain killers can help, but use them sparingly. Use them when you have to, and if you can treat the pain in other ways, you should. 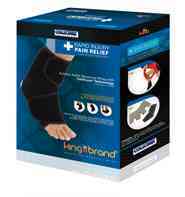 King Brand Healthcare® manufactures a broad line of ColdCure® cold compression wraps specifically for treating inflammation and pain. These innovative devices are incredibly soothing and very effectively reduce swelling. Gout is an extremely painful and debilitating condition. NSAIDs such as ASA, acetaminophen or ibuprofen are often used to treat the pain but these drugs do nothing to treat the actual condition. Cortisone injections are used in extreme cases but these too are intended to address the pain and do not promote healing of the injury itself. For many people dealing with Gout swelling and pain, nothing works better than cold compression. ColdCure® technology was developed specifically to address the need for a cold compression device that does not freeze the skin and underlying tissue. As a result, ColdCure® therapy can be applied for extended periods of time, providing superior relief from the pain and swelling that comes with Gout. While KingBrand® makes ColdCure® devices for all parts of the body, there's no better version than the ColdCure® Plantar wrap. Put it on and you will instantly feel relief and relaxation as it draws the pain and tension out of your foot and body. The slipper-like design and the soft, yet rigid, gel pack is just like attaching a magic pain-sucking pillow to the bottom of your foot. You can walk on it and it feels wonderful the entire time you are wearing it. The ColdCure® Plantar wrap looks like a slipper, but it is actually made entirely of very stretchy material. It wraps around your foot and applies a very gentle pressure over your entire foot area. The bottom of the wrap contains swappable cold packs of a very special design. They are soft and flexible and mold to the shape of your foot, yet the gel inside them won't squeeze out of place. Even under your full body weight the gel provides a wonderful, cool, cushion for your sore aching feet. Imagine having tiny waterbeds attached to the bottom of your feet - it feels like heaven! The gel packs aren't just along the bottom, they wrap completely up around the back of the heel, so they draw the pain and tension out of your entire foot and heel region. If the Gout is higher up your foot, we also have an ankle version that covers from the joints of your toes to high up on your calf. The gel packs in the ankle wrap are positioned over the highest blood flow areas, so that the cooling effects are transferred to your entire foot. If Gout is impacting another part of your body, check our shop. We make products designed specifically for many body parts. We have the right solution for you! The gel packs are easily swappable and each ColdCure® wrap comes with 3 gel packs. You use them 1 at a time, keeping the other 2 in the fridge, so you can keep swapping them out as many times as you like. A Gout attack doesn't just last for 20 minutes so you want a solution that you can use as long as the symptoms persist. With ColdCure® packs charged in the fridge there's no need to take a break between treatments. You can keep using them as long as you want pain relief. If you want the high power cooling of ice packs, you can store 1 gel pack in the freezer to start. Our gel packs are proven to stay much colder, much longer than cold packs you buy from pharmacies like Walgreens. 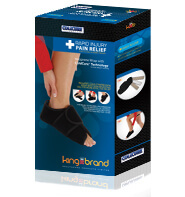 Only King Brand® makes serious cold compression for treating serious pain. Don't just treat the pain - heal the underlying problem. Gout is a form of Arthritis and there's no actual 'cure'. A Gout attack can be treated though. The attack goes away when the synovial fluid reabsorbs the crystals that have built up in the joint. There is a dense net of small blood vessels that provide all the nutrients for the creation and processing of synovial fluids, (it also feeds your cartilage). Blood flow through these vessels can be stimulated by using BFST®. Supplement the healing process, stimulate blood flow many times each day. Make regular BFST® treatments a standard part of your therapy. BFST® stimulates blood flow while the patient is at rest. This is very important, because while at rest, an unaided inflamed joint can otherwise have seriously impeded blood flow. It is the oxygen and nutrient-rich blood that enables the healing process; so adequate blood flow is required for the body to heal properly and quickly. BFST® kits have 3 different power settings, so you can continue to increase the power of your treatments as your Gout heals. During your first treatment, the area may feel quite warm. This is because, at first, your circulation is poor. The more you use the device, the less warming sensation you will feel. This is good. As the warmth lessens from treatment to treatment, this is an indication that the circulation in your foot is improving. Better circulation means more blood flow all the time, not just during treatments. This is the goal. When you feel very little or no warmth during a treatment, it is time to move up to the next power level. Don't rush it though, more heat does not mean better treatment. In fact, less heat means better treatment, so take your time moving up in levels. Some people find that heat can help with the pain. Others find that heat has no effect. Others may find heat adds to the discomfort. If you find the heat, you can move up levels quicker, otherwise keep the settings low. Less heat actually means better blood flow with BFST®. BFST® devices promote blood flow, accelerating the healing process. ColdCure® wraps relieve pain and reduce swelling. As Professional Therapists and Medical Practitioners know, it is in your best interest to treat patients quickly and completely. Using regular, alternating, BFST® and ColdCure® treatments a patient will heal quickly and completely, with minimal swelling and pain. This ends up in lower treatment costs, greater patient satisfaction and a reduced chance of re-injury. The combination of BFST® and ColdCure® therapies result in the least suffering and most rapid recovery. The BFST® (Blood Flow Stimulation Therapy) wrap is designed to promote blood flow in injured tissue below the dermal (fat and skin) layer. Utilizing our patented Energy Web®, specially controlled EMR energy envelops the affected body part and stimulates blood flow in the soft tissue deep beneath the skin. The resulting blood flow brings oxygen and nutrient-rich blood to the injured area, accelerating the healing process. As an FDA, Registered Medical Device the BFST® wrap is suitable for use in hospital and therapeutic clinics. Because the device is completely safe for patients to use themselves, the BFST® wraps can also be used by patients at home. Home use reduces in-clinic medical costs and further speeds up healing times. The BFST® device's Energy Web® is enclosed in a soft, comfortable neoprene wrap. The wrap shapes the Energy Web® to mold around the specific body part, to ensure there is an even distribution of energy over the entire treatment area. All styles of wrap are opened and closed using attached Velcro straps that guarantee a perfect fit. Also, the wrap and unwrap design allows for easy application over painful joints. After treatment, the wrap does not need to be removed. After treatment the straps can be further tightened, to provide snug support and protection for the injured body part. The gentle compression will continue to reduce inflammation as long as the wrap is worn. The device disconnects at the wrap from the power supply and controller, so the user is free to move about the treatment clinic or home when not receiving treatment, while still wearing the wrap for support, comfort and relief from swelling. Cold compression wraps are standard medical products for the treatment of pain and inflammation. Cold and compression applied to an injured joint immediately reduces the risk of further damage from excessive swelling. This swelling can be in the muscles, ligaments, tendons, or tendon sheath, or other soft tissue. Doctors and Therapists agree that controlling swelling is a fundamental part of reducing long-term permanent damage as a result of a soft tissue injury. All King Brand® ColdCure® wraps are medical-grade cold compression wraps designed for use in hospitals and injury therapy clinics, (home use is becoming a lot more common). The ColdCure® wrap exceeds all government and health agency regulatory requirements for cold therapy, specifically for use on soft tissue injuries. Improving on the RICE standard of injury care, ColdCure® wraps are specifically designed to operate at refrigerator(not freezer) temperatures. This eliminates the potential of skin damage during treatment associated with all freezer wraps. This improved standard is called RCCE® (Rest, Cold, Compression, Elevation). RCCE® allows for the wraps to be applied to the patient and used while unattended by a physician or clinician. This is very important given the likelihood of skin damage from alternative devices which use cold packs charged in a freezer. The over-sized cold packs in all ColdCure® wraps contain a specially designed gel formulation with a longer lasting cooling treatment time than standard wraps. This allows for longer treatment durations without having to recharge the wrap or switch cold packs. The longer treatment times and more cold power means more pain relief, better control of swelling and less handling of the injured area. These all result in a better treatment, giving your body the most effective pain relief treatment it can receive. Like the BFST® wraps, ColdCure® wraps are enclosed in a soft, comfortable neoprene shell. The gel pack is specifically designed for the shape of each body part. The wrap molds the cold pack around the body, to ensure there is an even distribution of cooling power over the entire treatment area. We do not use one common gel pack in all our wraps - every body part is shaped very differently from any other body part and each body part deserves a custom-designed pack if it's going to work the best. No other wrap in the world has specifically designed cold packs for each and every part of the body. This product has in every way been designed to be 100% a Gout treatment device. The ColdCure® wraps use RigiGel® technology so that the gel does not flow away from the injured area when pressure is applied. The gel stays in place even under pressure. Yet it is still soft and molds to the body. ColdCure® wraps are unique and of a higher quality and performance than any other wrap available. Nothing else comes even close. Again, like the BFST® wrap, the ColdCure® wrap is opened and closed using attached Velcro straps that guarantee a perfect fit. The wrap and unwrap design allows for easily application around a tender, injured joint without having to slip into or out of a sock-like device. Compression definitely helps with swelling. 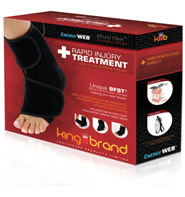 Both King Brand® BFST® and ColdCure® wraps are excellent compression wraps. Both can help with swelling. For some people heat helps, for others cold works better, some people use both. You won't know until you try, but do try - because when you find which one works, the relief can be amazing. Stimulating blood flow does not have to mean heat. A BFST® wrap can produce very little warmth and be very effective at stimulating blood flow around the synovial membrane. Different people respond differently to treatments. What works well for one person might not work for another. You have to find out what works for you. King Brand® offers a money back guarantee that allows you to try both treatment options. Most of the time people keep both products. But if one of them isn't helping you can send it back. We only want you to have products that help. King Brand® soft tissue rehabilitation medical products are the #1 choice by top Athletic Therapists and Medical Practitioners world-wide. We provide guaranteed results and customer satisfaction. Like all King Brand® products, there simply isn't a better performing option. We know you will love them because thousands of people already use them and rave about the results. Note from KB WebMaster - The text below is primarily intended to assist with Google properly classifying this page content. To learn more about our products please visit our website.<br>Gout plagues many people. Bad gout causes joint pain. There are many symptoms of joint pain caused by gout infections. Treatment for your gout will cause your joint pain to improve and your gouty joints to heal. There's no doubt that to heal gout quickly you need BFST treatments. Coldcure will help with gout pain. You can relieve gout pain with BFST and coldcure technology. So, if you want to heal your gout quickly, you need BFST. If you want to treat gout pain you need coldcure. Gout symptoms are joint pain and swelling. The best gout treatment is BFST. The best gout pain treatment is coldcure. These wraps are incredible. They feel comfortable. They work.